Total expenditure of the 2013 Budget is $58.4 billion compared to last year’s $54.6 billion budget. Total projected revenue, oil revenue and non oil revenue are projected at $50.7 billion, $20 billion and $30 .7 billion respectively. The Budget also caters for a fiscal deficit of $7.669 billion or 4.6 percent of Gross Domestic Product (GDP). While Howai told Parliament the 2013 Budget was pegged against an oil price of US$75 per barrel and a gas price of US$2.75 per mcf (million cubic feet), the Finance Ministry last night issued a correction saying the oil price was US$80 per barrel. The 2012 Budget was pegged against a US$75 per barrel oil price and a gas price of US$2.75 per mmbtu. 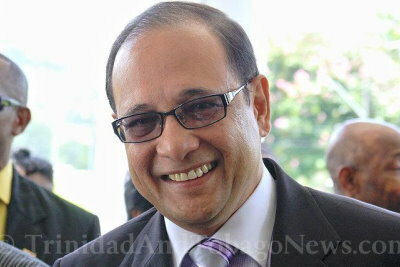 However, Howai said because of the need to avoid a rapid increase in the rate of inflation and minimise the effect on the most disadvantaged in the society, he proposed “a gradual reduction in the fuel subsidies beginning with the price of premium gasolene.” “Effective October 2, the price of premium gasoline would be $5.75 per litre,” he announced. The price for premium gasolene was previously $4 per letre. Stating an inter-ministerial team will look at additional measures which will reduce the current levels of subsidy, Howai said Government will invest in a $1.5 billion business plan to convert gasoline vehicles to CNG as an alternative to transportation fuel. Upon first issue, the fee for a driver’s permit will remain at $500, while the fee for five-year and ten-year renewal periods would be $500 and $1,000 respectively. He indicated that subject to approval of The Council for Trade and Economic Development (COTED), a 30 percent import duty will apply to used tyres entering the country. New tyre imports currently have this duty. These increased taxes are $50,000 per annum for every baccarat table/device; $60,000 per annum for every black jack table/device; $75,000 for every Caribbean Stud Poker table/device; $35,000 per annum for every dice table/device; $30,000 per annum for every regular poker table/device; $2,000 per annum for every pool table/device, $75,000 per annum for every Rum 32 table/device; $60,000 per annum for every roulette table/device; $75,000 per annum for every Sip San table/device; $12,000 per annum for every slot machine/online gaming device and $30,000 for every other table or device. On property tax, Howai said a Land and Building tax regime will be put in place in the next fiscal year, “which will cover residential, commercial, agricultural and industrial land.” He gave the assurance that, “this regime will be fairer and more equitable than that which was previously proposed.” Howai explained that until this regime is implemented, “we shall continue the waiver of tax liabilities which commenced in 2010.” As he made this point, some Opposition MPs quipped “poor Prakash” as they looked at Congress of the People (COP) leader and Legal Affairs Minister Prakash Ramadhar who spearheaded the party’s famous “Axe the Tax” campaign. On crime, Howai announced that special reserve police officers will benefit from the non-taxable allowance currently enjoyed by other members of the protective services with effect from October 1.In terms of retirement pension, Howai said the old earnings class system will be changed to a career-averaged-indexed earning system. The present contribution system would be modified to change the contribution rate of 11.4 percent to 11.7 percent in 2013 and 12 percent in 2014. Howai said this will result in a small increase of 0.1 percent for employees and 0.2 percent for employers in 2013. He announced an increase in maximum insurable earnings from $8,300 this year to $10,000 in 2013 and subsequent increases of $12,000 (2014); $13,000 (2015); $14,000 (2016); $16,000 (2017); $18,000 (2018); $20,000 (2019) and $22,000 (2020). Confirming Newsday’s exclusive story yesterday that the Budget aimed to boost the construction sector, Howai said Government proposed to expand the housing stock by offering tax incentives to housing developers. He said these measures would apply to houses where construction started after October 1 and the building cost does not exceed $1.5 million. He also said the National Self-Help Commission will help disadvantaged citizens to build their own homes, with a target of 100 homes per year over the next three years. Regarding the construction of commercial buildings, including multi-storey car parks, Howai proposed an exemption from corporation tax for a five-year period in respect of the profits earned in the construction and rental of these buildings. On food, Howai said Government proposed “on a temporary basis that Value Added Tax (VAT) be removed from all food items except luxury items and alcoholic beverages.” Howai did not identify the food items which will be exempt from VAT or those that will not. Saying Government wanted the non-energy sector to account for 66 percent of the country’s GDP, Howai highlighted creative industries as an example of one of five non-energy businesses which would achieve this objective. …price of premium gas shoots up to $5.75 per litre, an increase of 43.75 per cent. Shortly after Finance Minister Larry Howai announced an almost 50 per cent increase in the price of premium gas, several gas stations in south and central Trinidad closed their pumps saying they had no gas. PRIME MINISTER Kamla Persad-Bissessar yesterday described the 2013 Budget as one for “the poor man” and the “middle-income” class, as she defended the decision to remove the fuel subsidy on premium fuel. Prices on about 7,000 food items stand to go down in the consumer’s grocery basket, Prime Minister Kamla Persad-Bissessar disclosed yesterday as she accused Opposition Leader Dr Keith Rowley of “deception” over his claim that most items are already VAT-free. Minister of Energy Kevin Ramnarine expects that the country will save “hundreds of millions of dollars” when the subsidy on premium fuel is lifted today. Reducing the subsidy on diesel would have been more effective than on premium gasoline, Trinidad and Tobago Automotive Dealers Association president Visham Babwah has said. FORMER Justice Minister Herbert Volney missed yesterday’s presentation of the 2013 Budget in the House of Representatives. OPPOSITION Leader Dr Keith Rowley yesterday declared he was unimpressed with the 2013 Budget which Finance and Economy Minister Larry Howai read. FINANCE Minister Larry Howai yesterday received both praise and condemnation as experts weighed in on his $58 billion budget presentation. …a 150 percent tax deduction up to $3 million will be allowed for the corporate sponsorship of audio/visual or video productions for the purpose of local education or local entertainment and the same incentive could be claimed by local production houses on their own productions. Mr Howai, who three months ago had been a top bank executive, not publicly identified with the People’s Partnership, presented a statement lacking in political hits, targeted references, or hook lines. Budgets are never for the poor. It is always to enhance the rich. After every Budget the poor complains more. 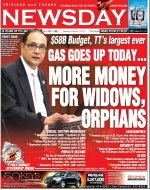 $58 billion budget but all the newspapers ran as headline was an increase in gas prices. There is no doubt in my mind that the good times are here again in sweet TnT the land of milk and honey. (Lol). But like all nations spoiled with wealth, the complainers, marchers and anti government forces are meeting under the astute leadership of pathological liar Dr.Rowley. The unions are not happy ( they will never be happy) Cabrerra, Roget, and other tribalist plan to bring the nation to its knees. They will only be happy when TnT become like the Congo, civil war, murder and mayhem everyday. It is in their DNA. But back to the budget, $58 billion and it is growing at an astronomical pace, from a paltry $13 billion just 12 years ago to almost 350 percent increase. Bas with low oil prices was able to build one of the best airport in the Caribbean. And build over 32 schools. Let us hope that the nation receives value for money. Money can be a blessing as well as a curse. The announcement of the removal of Value Added Tax (VAT) on food items which still bore it, save for luxury items such as caviar and alcoholic beverages, with the inference that it would effectively bring down the cost of living, was an unfortunate joke. Many lower income Trinidadians and Tobagonians either do not buy the now zero rated items or hardly ever do so. In turn, average middle or upper middle income households, which purchase the items, will “save” anything between an estimated $75 and $80 a month! But while the People’s Partnership Government trumpeted the savings, following on the public declaration at a pre-Budget rally at Mid Centre Mall last weekend, the nation was bracing itself for massive increases in the nation’s cost of living, with the news that the fuel subsidy, introduced on petroleum products in 1974, may shortly be history. Already, premium gasolene, one of the major components of the fuel subsidy, has been, unceremoniously, pushed off the list and as from yesterday was sold at service stations at $5.75 a litre. Other fuel subsidy products waiting to be pushed aside are regular gasolene, domestic kerosene, industrial kerosene, marine diesel and gas oil. While the fuel subsidy is estimated to cost the State $4 billion annually, it not only saves taxpayers, individual or corporate, billions of dollars annually but makes the nation’s products more competitive in the international market place. Next to the Common External Tariff (CET), it allowed Trinidad and Tobago produced goods and services that more favourable entry into the markets of Member States of the Caribbean Community of Nations (Caricom), and has been a major contributory factor in Caricom being this country’s second largest export market. The United States is the largest. In addition to the above pluses, the fuel subsidy, the brain child of the nation’s first Prime Minister, Dr Eric Williams, ranks with the Caribbean Basin Initiative (CBI) as one of the keys to export market share in the US. Going yet further, it was one of the key factors which contributed toward making Port-of-Spain, the preferred candidate in the memorable race to be the headquarters of the now abandoned, or is it temporarily sidelined, Free Trade Area of the Americas (FTAA). Yet, oddly enough, as Trinidad and Tobago gears itself to increase its market share in the unsettling challenges posed by the international financial crisis, its fight to tap, increasingly, into the emerging Latin American market is being made, however unintentionally, that much more difficult by the embarrassingly clear lack of foresight by the People’s Partnership Administration. Yet it is not too late for the Government to rethink the issue. Meanwhile, TT’s United States petroleum market as well as its refined petroleum products market in the Commonwealth Caribbean is under siege. The US, because it is bent on fully developing its shale oil and gas fields will import considerably less of our energy supplies. Additionally, our energy market in Caricom has been affected, adversely, by Venezuela’s Petro Caribe strategy to increase its (Venezuela’s) crude oil markets in the Commonwealth Caribbean at the expense of Trinidad and Tobago. And even as TT turns to expand its energy markets in South America, Brazil which for decades has been a major producer of cocoa beans and coffee seeks to become a not insubstantial producer of crude. Added to this is the reality that TT’s crude oil and natural gas reserves are dwindling and are expected to run out in a matter of decades. The need to develop the non-energy sector is crucial, and an important part of this strategy is the fuel subsidy, which has made and continues to make Trinidad and Tobago’s non-energy sector products more competitive regionally and internationally as well as in the domestic market. The formation, several years ago, of the Association of Caribbean States (ACS), embracing Caribbean countries and South and Central States washed by the Caribbean Sea, and headquartered in Port-of-Spain, provides Trinidad and Tobago with easier access to these countries’ markets. But the need to be competitive which was always there remains there. And with nations, such as India and China, turning out cheaply produced goods the need for TT goods to be competitive in the ACS market, as well as in all other markets, is critical. Factors which have led within recent years to an expansion of non-energy trade between this country and the ACS and other areas of Latin America have been our bankable work force, fuel subsidy, strategic location and with these the cost of our products. Abolishing the fuel subsidy will erode our competitiveness.